Office design is influenced by a number of different factors like industry trends. A good example is the recent trend of standing desks which have been said to have excellent health benefits and can help with posture. Some doctors have recommended the use of standing desks for health problems. They have also been said to increase energy levels of employees and reduce the “afternoon slump”. When it comes to schools, the educational industry has taken great leaps toward collaboration and teamwork in the classroom which has influenced classroom design. Technology also has a significant influence on office design. Laptop computers have created flexibility in office environments; they have also created the need for modular office furniture. Computer labs, media centers, and learning commons at schools were introduced based on advances in technology. Another influence on office design is employee profiles. Employees that prefer a collaborative office environment will enjoy a more flexible, open office design. 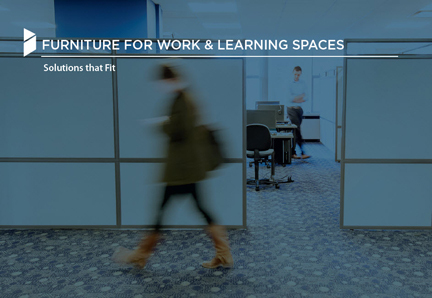 Modular office furniture can be rearranged or combined in different configurations to provide privacy, promote productivity and efficiency in both an office and classroom environment. Nowadays, it is very important to design an office with scalable furniture. With modular office furniture, a company that starts out small has room to expand without a significant increase in cost. This type of furniture is efficient and allows the full use of a limited amount of space. The education industry is a great example of why it is important to design a scalable and dynamic office. Oftentimes, classrooms, administrative offices, and computer labs have obstructions, such as columns and poles, which can be hard to work around. Using scalable furniture can make the best use of a limited amount of space. First impressions are very important to parents and the right furniture can make a big difference when it comes to this. A good environment will also make teachers happier and students more productive. In technology, STEM, and computer labs, where collaboration is important, the flexibility to move and rearrange furniture can make a big difference in productivity and learning for students. Designing a dynamic and scalable office from the start can save time and money, and increase efficiency and productivity. Visit our testimonials section to see examples of office and school projects from across the country, or if you’re ready to get started please Contact Us.